Decluttering is a dreaded, but unavoidable, task. There are a many different ways to approach the process, but sometimes you just want to get this unappealing job done as quickly as possible. If that’s how you feel, you’ll want to read on to discover tips on how to declutter an entire room in one afternoon. 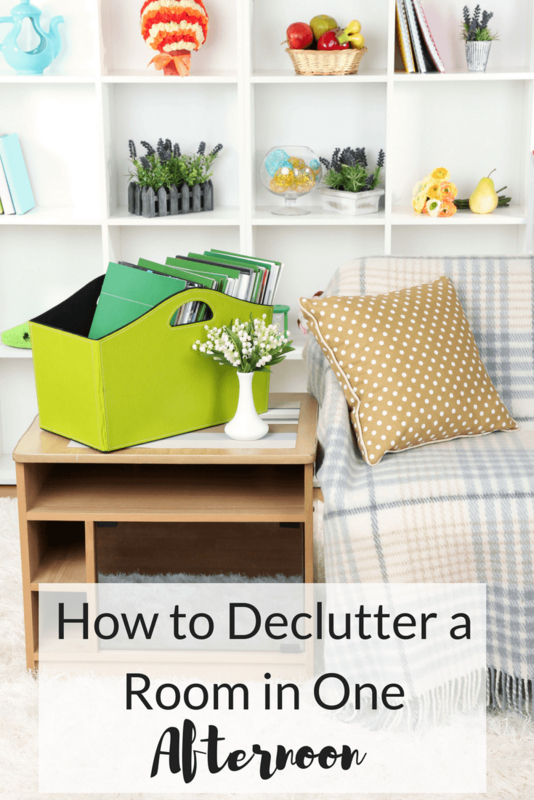 Decluttering is the first step to getting a room organized–you need to weed out any trash, broken items, and unwanted items before you can get the important stuff organized. Getting rid of excess stuff can help you feel less anxious (less stuff to manage), save money (you don’t spend money on replacing things you already have but can’t find), and bless others (donating excess items to people in need). So don’t be afraid to declutter…it’s a really good thing! You’ll need some tools to make this job easier. Be sure to have large garbage bags for trash and recycling. Get some baskets to hold things you plan to keep or sort and cardboard boxes for donations. You’ll also need post-it notes and a marker for labeling. Finally, a timer will keep you on track. Having boxes and bags for sorting will make the decluttering process so much easier. When you put things into piles on the floor, for example, it’s easy to forget which pile is which (trash or donate?) and the things tend to get mixed up. Set aside a large space for sorting; this can be on a bed, a card table or just the middle of the floor. Use the post-its and marker to label your baskets. You’ll want one for Keep, one for Action Needed (for repairs, returning to friends, etc. ), one for Sell and one for Move (to another room). You might be tempted to skip making a basket for items that need to be moved, but it’s actually designed to help you stay on track. Leaving the room in order to put things away can distract you, and then the job takes a whole lot longer. Strategize the way in which you plan to tackle the room. Always go in a single direction, focus on one shelf or drawer and commit to never returning to an area you’ve already hit. You may wish to start with the back of the room and work from left to right, then toward the door. Or you could begin at side of the room, moving steadily across to the other side. Just have a plan and stick to it. Before you get down to the nitty gritty of emptying drawers or clearing shelves, it makes sense to get rid of any large items you can. Set a timer for 15 minutes enlist a friend to help carry and start moving any big stuff you plan to get rid of in some way. Stuff like furniture falls into this category. Take another 15-minute sweep if need be. Once again, repeat the process with the small things. This is likely where you’ll need your sorting space like the bed or card table. Handling the smaller items might take longer due to the sorting process, so feel free to set your timer a few extra rounds. If you need some help with the decluttering process, you’ll want to read the book Clutter Free by Kathi Lipp, which I recommend as part of my favorite organizing resources.